I’m having one of those “work from dawn till midnight” kinda weeks. You see, despite my screw up with the deadlines Unique LA let my apply late and I got and and the show is this weekend. It’s gonna be great! I’m pretty excited and a bit nervous. This will be the first time, I have a whole booth to myself. I’ve been working on new set up (pictures to come…. spoilers – I used the color green! Shocking I know! ), building display, making tons of coasters and, well, everything else – letters, home signs, subway art, candle blocks etc etc. 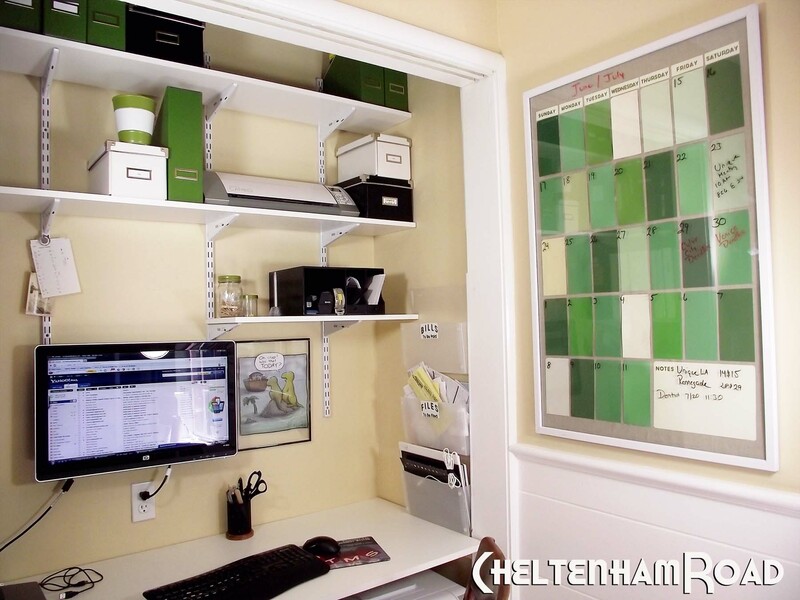 In the meantime – the paint chip calendar I made for my workroom makeover seems to be popular on Pinterest and I’ve had a couple of people ask me how I made it so I thought I’d do a quickie tutorial. By “quickie” I mean that I really don’t have any pictures to illustrate much so bear with me. 1) After a light sanding I painted the frame with a gloss white spray paint. 2) My frame was empty when I bought it so I cut a piece of foam core to use for the backing. 3) I sprayed the adhesive on the foam core and then placed my fabric over it smoothing out the wrinkles. I then flipped it over and folded the extra fabric on the back and taped it in place. 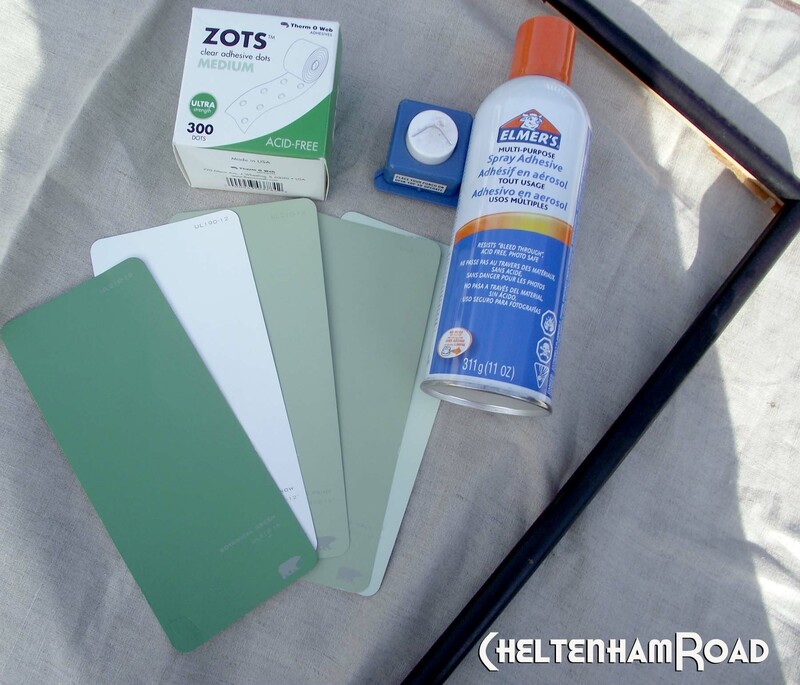 4) I needed a big calendar and I found that Home Depot’s Behr line has the largest paint chips around. They were a little too large actually. After doing the math I trimmed them down to 3” wide and 5.75” tall. I also used my little round-over corner trimmer on the top left corner. 5) As you may have gathered this was a bit of “grab what’s around” project and I had some of those glue dots so I used them to stick the paint chips to the fabric. To be honest this met with mixed results. A few of the paint chips just would NOT stay stuck. I have no idea why – the rest of them seemed to be with the program, but just a few kept falling off. I eventually (and somewhat crankily) just used a dab of Elmers glue to hold them in place. 7) I re-assmbled the whole thing and BOOM! Wall calendar. So, I apologize again for the lack of photographic accompaniment but I hope this answers a few of the questions about the calendar. And if you’re an LA kinda person please do come to the Unique Show this weekend! Thanks for the tutorial! Great calendar idea and can be color coordinated for anyones decor!! You mean someone might want to use a color other than green!!!!!!?????? I just can’t imagine that scenario. Love, love, love this! So simple, and fun! I love all of your creations! Hi! This looks great!! Is the part you write on glass or plastic? I wondered about the erasibility of plastic but like that it is lighter than glass. Thanks! Thanks Samantha. Excellent question – sorry I didn’t address it. My frame had a piece of glass which works great. I don’t know if plastic would hold up in the long run – you might end up with those un-erasable bits. It’s certainly worth a try though. I use a Dollar Tree frame with plastic instead of glass as a menu board and have had no problems with erasing. I’ve been using it for a couple years now. Will it sync with my Google Calendar? You know I loved this when I saw it. I hope Unique LA went well! HA!!! OK, that totally made me laugh out loud. I love this! I featured you over at my blog today so my readers can hop over here to see the full tutorial. Thanks so much for a great idea & thorough tutorial! Thanks Kristy. Yours looks terrific! Thank you! 🙂 This is going to be our craft at an upcoming MNO: Pinterest party! I just saw this on the money saving expert site in the UK I absolutely LOVE it. I shall attempt to make myself one after Christmas as I’m too busy shuffling everything I have to do! It’s all written on a piece of card, it will look much nicer on one of your boards! Hi Rick. I just use the standard dry-erase markers that you’d use on a white board. Hey Hannah. I don’t know about laminating though I don’t see why it wouldn’t work. Plexiglass/plastic will work just as well as glass though if that’s an option for you. I was wondering where you got those great clear wall mounted pockets for mail etc? They are from the Container Store. I think you get (or got….it was a while ago) three for $20 or so. beautiful idea. ok so i need to write down an event that’s happening next month … wait a minute how do i do that? There are a couple of options. I added a “notes” area to the bottom right corner of mine (you can see it in the photos) where I jot down things that will be landing the following month. 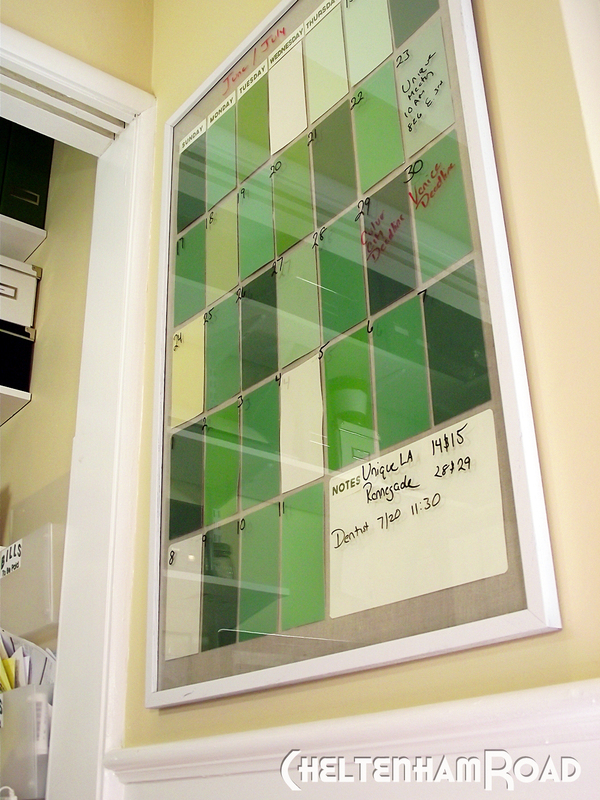 Or you can cut down the size of your paint chips to get a few more weeks onto the calendar. Love this idea. Thanks for sharing the tutorial. Bookmarked! This is exactly the sort of thing I’ve been looking for to help organize my and my son’s schedules. What size frame did you get? was it 16×20 or 24×36?